From the day that I was diagnosed to the weeks after the shunt insertion and still to this day, my family and friends played such a huge role in my recovery. I think we too often take for granted how important having a reliable support group can be – but they are so much more than that. Having someone to laugh with or who can take your mind off things can go a long way during a period like this. For the first time in three months, I had consecutive weekends filled with socializing and excitement. On Sunday, September 14, 2008, the Giants were playing the St. Louis Rams. I was downstairs watching the pregame show when the doorbell rang. My mom yelled down to me: “Chris…there’s someone here to see you.” All I wanted to do was the watch the game! Well when I went upstairs, at the door was my friend with a tray of food. I looked at him and then looked back at my parents – did I miss something? One by one, all my friends came over to the house to watch the game with me. Surprise! I was in shock but elated nonetheless. I just couldn’t believe that everyone had come by just to spend the afternoon with me and hang out like we had grown so accustomed to doing. I had not been in a social setting with so many people in a long time and was uneasy at first. My scars were still not healed, so I put on my baseball cap backwards to cover them up and I was ready for a great afternoon. The last time I had seen everyone all in one place was the afternoon prior to the emergency surgery to remove the hematoma that almost took my life. On that day, I was a shell of the person I was on game day. My friends looked at me in amazement – it was awesome. We joked, laughed, ate everything in sight and as if that day weren’t bittersweet enough, watched the Giants were victorious. And speaking of joking, out of nowhere, I heard a couple of friends doing impressions of Arnold Schwarzenegger, but what do you think the quote was? None other than “It’s not a tuuuuumor!” from Kindergarten Cop. Some things just never change…. I was so excited that they came by to break the ice and hang out with me, but what I remember most of all is that they did not let it bother them that I was still not 100% and looked somewhat like Frankenstein. They all could’ve gone to the sports bar to watch the game but instead they came over to watch the game with me. Those are true friends and a sure way to make anyone feel good about themselves, no matter the situation. The game ended too soon but I was already busy looking for plans for the following weekend. I talked to Ashley almost every free chance I had the following week and practically invited myself up to Rhode Island for the upcoming weekend. I had been cleared to drive but Ashley, being the nervous Nellie that she is, pleaded that she come down to Connecticut to pick me up. Believe it or not – I turned down her offer and drove. This was such a liberating feeling and something I had to do in order to regain my confidence with everyday tasks. To this day though, she still shakes her head when I remind her about that decision. Driving across the Newport Bridge and headed north towards Bristol, I had flashbacks to the last time I was in Newport – the afternoon walking the town with my mom searching for apartments to rent for the upcoming year. As I was having these thoughts, I quickly realized how fortunate I was after living through such a harrowing life experience. I then crossed over the Mt. Hope Bridge and felt like I was back where I belonged. Coming over the bridge, I could see the red, white and blue painted lines on the street. Over to my left, there was the law school. I took a good long look at it. I told it that I’d be back, but not yet. First things first – visit Ashley and the rest of my law school friends. The last time that I had been with everyone all in the same place in this setting was the day of our last final. If you’re unfamiliar with law school, you enter as a 1L and spend the duration of your 1L year with the same group of people. I found this to be beneficial because many of our classmates became very close friends with each other. We got each other through the many ups and downs. And on the day of our very last final, after all appellate briefs had been written and argued and final exams completed, it was time for a proper send off at one of the local pubs. So when I saw everyone together for the first time since that day, it was bittersweet. I was still wearing my hat backwards to cover the scars and somewhat nervous to be around such brilliant people. I had just spent my summer reading Dr. Seuss books and memorizing farm animals on flash cards while everyone else spent their summer in law offices. “What was this going to be like?” I wondered. But then I realized – I’m a warrior and though I was nowhere near as smart as those I associated with, I was now mentally tougher. There was a “Section C” party at one our classmate’s house and there I was – laughing, talking and having a good time just as I had done months earlier. Friends are always there to pick you up when you’re down and help you through the tough times. For me, I was quickly shown two weekends in a row how important friends and support groups are and can be. And that’s one of the reasons I’ve decided to now give back. I recently reached out to the Connecticut Brain Tumor Alliance to discuss ways in which I can pay forward the gift that I have been given. While I can never provide a medical miracle, I am able to be there to listen to those who are undergoing what I went through and show them that through their adversity, things can and will get better. But for those friends, I would be a shell of the person I am today. To them all – thank you. You each played a profound role in my recovery and showed me the power of friendship…and for that, I am forever grateful. So you’re probably wondering whether the story is over now. Well, fortunately for you but unfortunately for me, it’s not. Once I was released home with the shunt in place, I was in a “wait and see” holding pattern. Sure, things were going really well immediately after the procedure but everyone, myself included, was curious what the following weeks and months would bring. Just as quickly as I had my cognitive functions restored, my life was placed back on hold some more. Nevertheless, I was not deterred and was prepared to move onward in this fight. Good riddance to the powder I used to have to add to my liquids due to this cough thing I developed at some point. Goodbye Dr. Seuss, thanks for the memories! “Red fish, blue fish”– how about “no more fish”? And how could I forget to say goodbye and thanks for the torment from those daily quizzes about news stories I’d have to read and try to write about. It was all quite easy to push this off to the side and focus on getting back where I had left off. To start, the rehabilitation center wanted to see me again so they could conduct an independent evaluation and “close their file” on me if they determined there was nothing more for them to do. For once, I was excited to go to rehab. I’m not typically one to boast, but I was chomping at the bit to go there as I continually recalled the conversations between the therapists and my family where it was doubted that I would ever recover. I’ve said it a lot, and I’m saying it again – I knew all along that I was in there. So on the day that I returned to Gaylord, I could not wait to walk in there and show them the “real” me. When I stepped off the elevator, amidst the buzz in the common area with patients coming and going, I saw my speech pathologist wrapping up her session with a fellow speech therapy patient. When she saw me, she eagerly waved and indicated that she would be right with me. I raised my chin proudly and exclaimed, “Take your time, no problem!” Yea, this was going to be a great day. During our one-on-one time, she asked the typical questions – this time however, I answered each with ease. Her face said it all. “Go ahead, pinch yourself” I felt like saying, “but this is no dream.” I proclaimed that a medical miracle had occurred. In all my years of living, I have never seen someone look at me in such awe. But that’s the reason I’m sharing my story – to exemplify the beauty and amazement of the brain. As I said a few paragraphs ago, my ability to recover was doubted. I have grown accustomed to hearing people doubt the ability of the human brain. There was still one last thing she wanted me to do before signing off on my release from therapy. As part of my homework during the months of July and August, I had been keeping a folder of worksheets and journal entries detailing my daily activities to submit it to her (looking back on that folder now, it was full of nonsensical and illegible papers). This was her method of tracking my ability to find the words to express myself, but also to see where I was on a cognitive scale. I had become accustomed to hearing her say what the assignment was and then having forgotten it completely by the time I even arrived home. This time though, the assignment was to write the story of my recovery. I couldn’t wait to hand-deliver it to her and when I did, she read it there and then. She smiled, shook her head in shock and awe and said there was nothing further for her to do. Things went very similarly with the physical therapist. Not only did I regain my cognitive functions but I also regained strength on the right side of my body. The facial droop had diminished, my handwriting drastically improved, I was able to walk on the balance beam again and could lift the five-pound weight ball with my right arm. Did I ever think I’d be freed from own brain? At times, no. But with hard work and persistence, the brain can adapt to any set of circumstances and overcome even the toughest of obstacles. Even still, while I was able to write a short story and converse, as well as use my mental energy to think, I needed to put all this to practical everyday use before I could even attempt to get back to law school. Will I wake up normal? Is there a chance that this surgery could lead to unintended consequences? What if they can’t get the shunt in place and find that there is no plausible way for me to have the device inserted – does that mean this is my life forever? Wait, what about my song? Within a matter of minutes of being taken into the OR, Dr. Piepmeier greeted me on the cold slab of metal and said the team of doctors was ready to get started and that he’d see me in a little while. Great, here we go again. 10…9…8… Sweet dreams…and knocked out I was yet again. Once I was out of surgery, I was wheeled down the hall back to the ICU to sleep off the anesthesia. Now, you have to understand that nobody in my family ever conveyed the odds and percentages of the surgery to me so I did not know what to expect coming out of this. Regardless of the odds, I knew it could certainly help me. In the midst of being woken up by the doctors and nurses, I recall feeling “different” somehow; I was able to recognize that the thoughts in my head were clearer and I was better able to understand the conversations that were taking place around me. However, it was still too early in the recovery process for me to test myself but I had a fleeting thought that perhaps my progress would now move along much quicker. But then again, I was still in such a fog that I was not able to fully appreciate what had actually taken place and knew I was being delusional. I was in and out from the anesthesia so I took the time to sleep, heal and recover. Still though – there was this nagging feeling that maybe I was back to my old self. When I had finally fully woken up and come to my senses, I again felt like I was in a dream. Things around me suddenly made sense and I was able to put 2 and 2 together to understand that I was now a bionic man with a valve system in his brain to help me function in society. Come to find out, my dream was no dream – it was reality. I felt just as I had prior to the time when all of this began. I was alert. I was watching TV and playing on my phone. Yes, you read that right – I was using my phone to read the mass of emails and text messages that had piled up from family and friends the past two months. And then the moment that I had been waiting for had come – my family had arrived. The looks on their faces were priceless…faces that I’ll never forget. I found that the moment was beyond satisfying. What an absolute whirlwind. Not less than 12 hours ago, I couldn’t say my own name, let alone say “hi” to my parents. They continued to engage me in conversation and I was actually doing it! Though my response time was slow, I understood all the questions being asked and was able to respond. The sound of my own voice had never sounded so good. I had shown my family and myself what I knew in my head – I was still in there and simply needed some manipulation to break free. And when the entourage of doctors rolled in, they bombarded me with the usual questions. This time I was able to tell them my level of pain in a comprehensible tone, replied that “yes, I do have a headache” and “three” in response to “how many fingers am I holding up?” Once they left, in came Dr. Piepmeier and Betsey. He looked at me in awe, but nonetheless asked me how I was feeling. I replied “great!” I remember him just looking at me, almost as if he thought he was dreaming but nope – this was no dream. When my sister and brother came to see me, I greeted them all as well. Overnight, I had gone from a shell of my old self to almost as good as new. Walking around the hospital hallways with my mother that day, we walked past a diagram of the brain and I stopped there with her to show her what had been done to me during the surgery. As I was explaining where the valve was inserted and where it was draining to, a voice behind chimed in and said “very impressive Chris.” It was Dr. Piepmeier. That moment is also one I’ll never forget. Two days later, my paperwork was being prepared and I was released – free to go home. When I got home, one of the first things I wanted to do was sit down at my piano and play. I was hesitant at first, but it was something that I had to do. I sat there, placed my fingers on the keyboard and I started to play. Without even thinking about it, that beautiful sound was coming out. Like it was yesterday, I began playing my composition and it was if I never stopped playing. I played the first few bars of the song and into it I went – remarkably, I had played everything I had written previously, but this time it sounded really good. Over the next few days, my determination to finish my song was completed and all I needed was a title. And then it hit me. 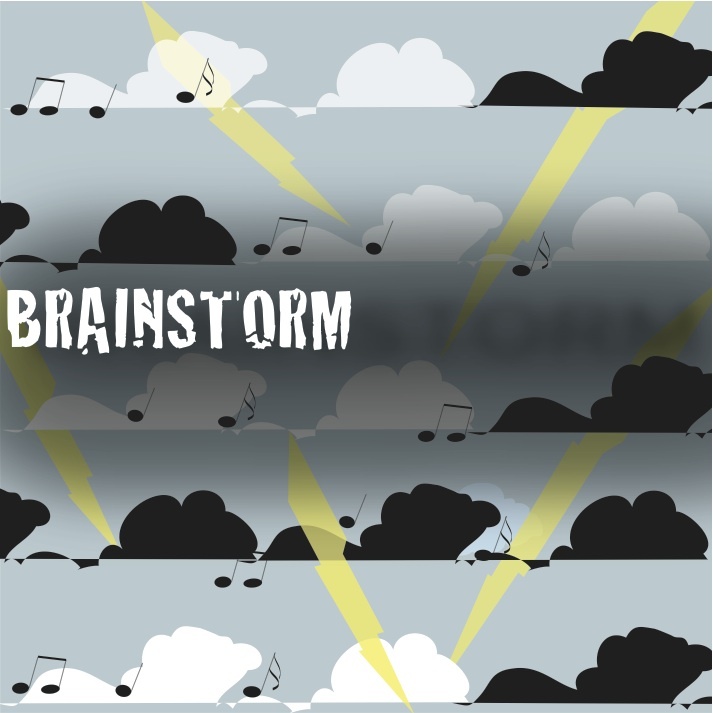 With all that had just taken place in my brain and the further brainstorming I was doing to find a title, I titled the piece, very simply “Brainstorm”. All of my posts’ titles have been these songs or lyrics borrowed from them. They express the chapters of my life and relay the emotions of my story. For me, music is everything – it is one of my passions. And miraculously, I had it back. At the age of 8, I began playing the piano and taking lessons. I grew up with the piano that my mother took piano lessons on and which I learned to play. Those of you who know me, you can attest to the fact that when I put my mind to something, I am determined to do it and do it well; it was the same way with my piano lessons. After returning home from Rhode Island in May of 2008, I began writing an original composition. When I played the song, my parents asked me what it was and I replied that it was a song I was writing but that needed an ending. 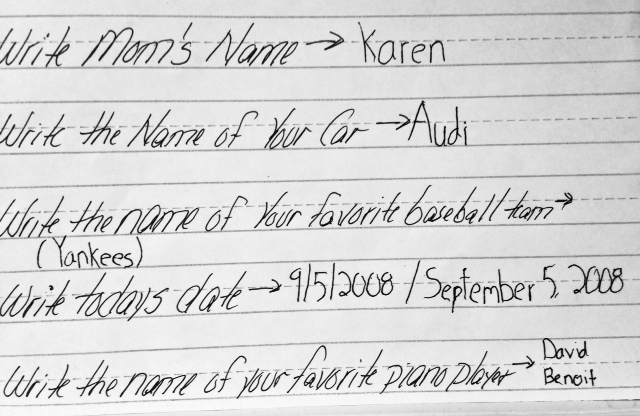 My family proposed some names and ideas, but none of them were what I was looking for – I needed to brainstorm. As Stephen touched upon in his toast at my wedding, one day in late August, the doorbell rang and it was our good family friend, Caryl. Sadly I say that I do not recall much else about Caryl’s visit other than me playing the piano for her. But looking back at it, I am beyond grateful she asked. Up to that point, I had not played too much as I grew far too frustrated with myself and my inability to play. But she did not care – she knew I had it in me and just believed in me. With Caryl and Stephen watching and waiting for me to do something, I sat down at the piano and took a deep breath and began to play. I managed to play as much of the song as I had written. I’m sure it was chock full of wrong notes and whatnot, but I had done it. A major accomplishment? No. But an accomplishment for me? Absolutely. The date was sometime in late August 2008 and things were still going downhill for me. I was making absolutely no progress in my recovery. My ventricles were still clogged from debris where the tumor sat and the hydrocephalus was acting as a crux in my quest to recover. After all, that’s what hydrocephalus is – a condition in which cerebrospinal fluid (CSF) builds up in the ventricles. Thus, the time had come to decide whether we would pursue the implantation of a shunt. Up to this point, my biggest decisions were what I would eat and which couch I would lay on for the day. When it came time to ultimately decide whether to pursue the shunt operation, I made my voice heard. I was yearning to break free. I knew this was my only hope and the best option. However, my parents had some remaining questions…. On the Saturday before Labor Day, I had a call with Dr. Piepmeier. Karen and I were debating back and forth the pros and cons of the potential shunt surgery, which had been whispered about since the initial surgery. The concern was that when Chris was initially admitted to Yale almost 8 weeks ago, he was already suffering from hydrocephalus. This was the most puzzling part of the situation to the medical staff…how was he even functioning? After 6 weeks of rehabilitation, almost no progress was made and the latest MRI showed that the ventricles were blocked and swollen, and the hydrocephalus was still present. Dr. Piepmeier and I then discussed the options, which were: (1) stay on course to see if the healing process would correct the situation or (2) to have the shunt inserted. We then talked about odds and percentages. After insertion of the shunt, approximately 80% of the patients will see improvement in their cognitive function within 6 months to up to 2 years…15-20% regain total cognitive function within 6 months…and a very small percentage, 1-2%, has an immediate cure overnight. We also discussed the potential risks. We were advised that there was potential for the development of a blood clot in the brain, swelling in the brain, infections and seizures. In addition, we were also told that there is a risk that the shunt could malfunction at some point and also that the shunt system would need to be replaced once, twice or even three times throughout Chris’ life. But just what if, in a miracle circumstance, Chris was the 1-2% case and the procedure worked without any unintended consequences and aided his recovery process? I then asked him what I still believe was the right question: “if Chris was his son, would he do the surgery?” His answer was an immediate yes. My vote was now to do the surgery. With all that I had been through up to this point, I felt that I had nothing to lose. I considered this to be the easiest decision I had been asked to make up to this point. I understood all of the risks and was realistic that even if the procedure went without any issues, it would still be a long road ahead. I knew that it was likely that no results would be seen for quite some time, but I knew my body better than anyone. The flash cards, ABC chart, workbooks full of addition and subtraction problems, the paper we all used in 2nd grade to practice writing in between the lines, etc. were simply not working. But more importantly, I was getting tired of being trapped inside my own body.